Halfbacks and high hills, arts and frogs, elk and Plotts — and how it all blends together in one of the most intriguing places in North Carolina. Editor’s Note: This story originally appeared in October 2012. Waynesville is an outlier. It rests in a valley in the western part of the state, 30 miles past Asheville toward the Tennessee line, where the state angles down to a thin wedge on the map. It is a small town surrounded by big peaks of the Great Balsam Range. Try to imagine Waynesville as North Carolina’s version of Shangri-la, the remote valley in James Hilton’s novel Lost Horizon, with its paradisiacal setting and contented population. Unlike the residents of Shangri-la, however, the citizens of Waynesville aren’t cut off from the world. Several major routes — U.S. highways 23, 74, and 276 — run through town, and Interstate 40 passes within 15 miles. With a population of nearly 10,000 in the most recent census, it is the seat of Haywood County. Waynesville has its own newspaper (The Mountaineer), an urbane dining scene, even a Wal-Mart Supercenter on the edge of town. It’s the largest town west of Asheville. Yet Waynesville does enjoy a measure of splendid isolation. Vast tracts of federal land, including half a million acres of Pisgah National Forest, enfold the town. The Cataloochee area of Great Smoky Mountains National Park is only a half-hour away. The Blue Ridge Parkway passes within seven miles of town, and the highest point on its 469-mile length — Richland Balsam Overlook (elevation 6,053 feet) — is not far up the parkway. Yet Waynesville is more than a gateway to the outdoors. It is a regional locus for southern Appalachian arts and crafts. Excellent farm-to-table restaurants and bed-and-breakfast inns make it a haven for getaways. It is a high-spirited place, celebrating everything from art to apples with festivals and street fairs throughout the year. And its Main Street is exactly that: a central place to congregate and a walkable strip filled with interesting shops, many of which are stocked with local arts and crafts. Waynesville gets its vibrant personality by using assets close at hand — locally grown foods, locally trained craftspeople — while also tapping the talents of those who have migrated here from other places. You’ll find locals with roots that go back generations. Certain old families — the Loves, Queens, Browns, and Ways — still retain great influence. In addition, a steady influx of outsiders retire or live part of the year in Waynesville. Many of them are “halfbacks”: local parlance for Northerners who retire to Florida, dislike the heat and crowds, and move halfway back to the North Carolina mountains. Waynesville is further spiced with arty, young upstarts — painters, craftspeople, musicians, organic gardeners, downtown entrepreneurs, baristas, and bartenders — who bring a vigorous alternative energy. Finally, tourists are drawn to Waynesville’s scenic splendor and small-town mojo, providing economic support and an ever-changing parade of faces. Few towns are blessed with so much beauty. Postcard-worthy views of forested ridges and peaks pop up all over. You can do something innocuous, like park the car and notice a breathtaking vista. That combination of everyday tasks and getaway views helped create Waynesville’s mixed population. 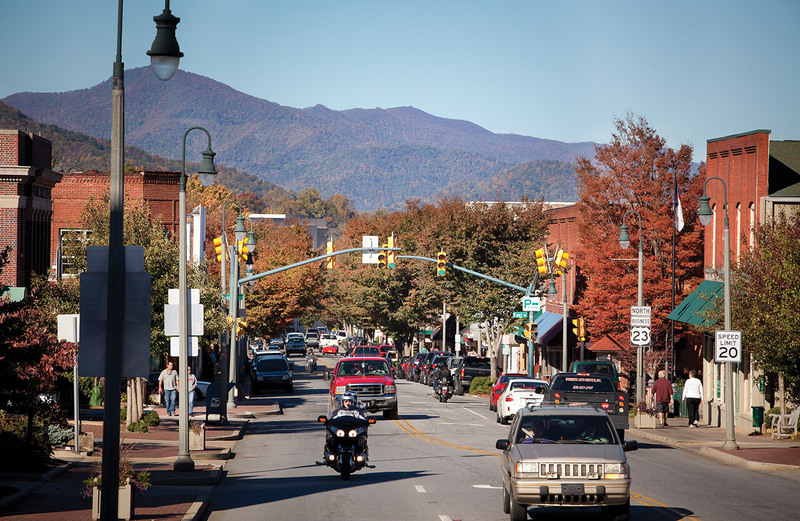 Walk downtown and you’ll hear variations of this: “I came to visit and decided to stay.” Local organizations market the town proudly and well, but the simple fact is — Waynesville sells itself. The cool, clean mountain air has long been a draw. Originally, people trekked here to escape the suffocating heat of the Deep South, especially after a railroad line made Waynesville accessible in the 1880s. “We had fresh air, and that was supposed to be your respite,” says Michael Beadle, a local writer and historian. The Waynesville Historic Preservation Commission protects and restores the town’s most distinctive homes and buildings. Among the survivors is Shelton House, an 1875 farmhouse that houses the Museum of North Carolina Handicrafts. Also on the property is a more recent construction: a performing-arts center with a 255-seat theater that serves as home to the Haywood Arts Regional Theatre (HART). Waynesville was founded in 1810 by Robert Love, who was a colonel in the United States Army during the Revolutionary War. He served under Gen. “Mad Anthony” Wayne, and later, he named the town after him. Wayne was legendary for his fiery temperament — hence, the nickname Mad Anthony. These days, he would be out of place in the town that bears his name. On a warm afternoon, I walk down Main Street, and something startles me: silence. At high noon during the busiest time of year, downtown Waynesville is strikingly serene. That’s not to say it’s deserted. People amble along the sidewalks, pop in and out of shops and restaurants, and traffic passes in both directions. Yet for a long moment, I hear nothing but a leaf-rustling summer breeze. The visitor-friendly heart of Main Street runs between Pigeon and Walnut streets. While perusing its shops, I start conversations with owners and employees, many of whom moved here from elsewhere. Walt Cook, who runs the Smoky Mountain Dog Bakery, retired to Waynesville from Ocala, Florida. He got bored and started this business to occupy himself. “I had three restaurants and a horse farm in Florida, and now I cook for dogs,” he says with a chuckle. A few doors down is Twigs & Leaves, a nature-inspired gallery owned by John and Carrie Keith. They are exiles from the Florida Panhandle who tired of overdevelopment in their native Destin. Carrie says that 90 percent of the artists represented in their store are locals. A map in the window has pins identifying the artists’ places of origin, and the densest clusters are in Waynesville and Asheville. At Gallery 262, proprietor Aaron Stone exhibits artists who are natives or have moved to western North Carolina. He carries the creations of local painters, potters, quilters, jewelers, and artisans who work in other media. The walls and display cases crackle with energy — Zen-like paintings by Asheville-based Philip DeAngelo and wildly vivid outsider art by John Fitzgerald, a refugee from the Bronx who settled in the nearby hamlet of Clyde. Stone suggests that I check out Frog Level, an older part of town reborn as a bohemian enclave over the past decade. It’s slightly off the beaten path, two blocks from the Main Street bazaar at the intersection of Depot and Commerce streets. It was once the center of town, until the train station stopped operating when rail service was discontinued in 1949. It is listed on the National Register of Historic Districts. Frog Level got its name from the croaking of amphibians in Richland Creek, which gurgles through Waynesville. It fell on hard times for a while, but the arrival of Panacea Coffee House — a spacious restaurant that reclaimed an old warehouse — helped spark a revival. Tandi Haas moved to Waynesville in 2009 after living for many years in Atlanta. She bought the Plott family farm, which belonged to German immigrants who began breeding hounds here in the mid-1700s. The Plott hound is the North Carolina state dog, and it is one of only four recognized breeds native to the United States. You could say that it is one of Waynesville’s noblest descendants. Haas doesn’t own a Plott hound herself; she doesn’t have time for one. She is hoping to acquire a trolley and draw up a tour of Waynesville’s shopping districts and historic sites. She operates Apple Hill Farms, a wedding and special-events facility, and she opened a store for brides called Apple Blossoms. She formed Destination Haywood, an alliance of businesses to market Haywood County as a site for weddings, small conventions, and special events. She wants to start a furniture-making business, too. Haas is the sort of entrepreneur who is driving Waynesville these days, and she is among the town’s most enthusiastic boosters. In 1973, a local Waynesville square-dance team performed at a British folk festival in England. One of the people accompanying the troupe, surgeon Clinton Border, found the mingling of cultures inspiring, and in 1983 he proposed that Waynesville hold a similar gathering. The town launched one of the biggest festivals in the state, the Folkmoot, which will celebrate its 30th anniversary in 2013. Folkmoot — an Old English word meaning “meeting of the people” — is North Carolina’s official International Folk Festival. It runs for two weeks in late July, drawing troupes of dancers and singers from far-flung places like Finland, Burundi, and Croatia. Performances take place in Waynesville and Haywood County, as well as other parts of western North Carolina. Waynesville is an open place. Just outside of town, Haywood Community College has a national reputation for turning out craftspeople in an innovative professional crafts program. Students take studio courses based on the materials they’re interested in: clay (pottery), fiber (weaving), wood (furniture), and metal (jewelry). While honing their crafts’ skills, they also study business and marketing. They leave with the tools to make art and to make money doing so. More than crafts are growing here, though. “Buying local” may be a phrase used everywhere these days, but it has been raised to the level of a mantra here. Waynesville now has three local breweries. Frog Level Brewing Company, Headwaters Brewery, and the Tipping Point Tavern all make their own craft brews. There is a bit of irony in this number, as you couldn’t even buy a mixed drink in Waynesville until 2008, when the community finally voted in liquor by the drink. Just four years later, Waynesville’s people are making beer they can be proud of. The people here have that spirit: Give them the freedom to do something, and they’ll do it as well as they can. After a recent trip to view elk in the pastures of the Smoky Mountains, a group of visitors returned to the inn to find a cookout in progress. The host expertly prepared sweet corn, salad, and grilled chicken with blueberry-chipotle sauce. The food and conversation continued until midnight. This evening epitomizes the casual magic that transpires on any day in Waynesville. Use the quick sign up form below to subscribe to our travel email newsletters. Parke Puterbaugh is a freelance writer in Greensboro. He is currently researching a book on beach music.